Reading Blind Aid Society was formed in 1883 and then changed to Reading Association for the Blind in 1926 and has supported the sight impaired people of Reading ever since. Our objective has been to enable sight impaired people to live full and active lives by providing the opportunity to take part in activities that they may otherwise not be able to, such as visiting our social club, rambling, taking part in our craft club, social outings, theatre trips, sport, holidays, learning new skills such as IT or accessing support from our home visiting service. People suffering from sight impairment often suffer with isolation and social exclusion and we do all we can to promote social interaction and inclusion in society. In many cases it can be difficult for them to leave their homes, to get out and meet people, so the service we provide is vital for their physical and mental wellbeing. Older people with sight loss are almost three times more likely to experience depression than people with good vision. Note We are looking for volunteers for: A minutes taker for our Management and Trustees meetings, fundraisers for events in the community, passenger Assistants, kitchen staff, and to serve tea/coffee and refreshments. If you wish you can register for Amazon Smile and choose 'Reading association for the Blind' as your charity, we will receive a small commission from every purchase you make on Amazon, and it will cost you absolutely nothing! 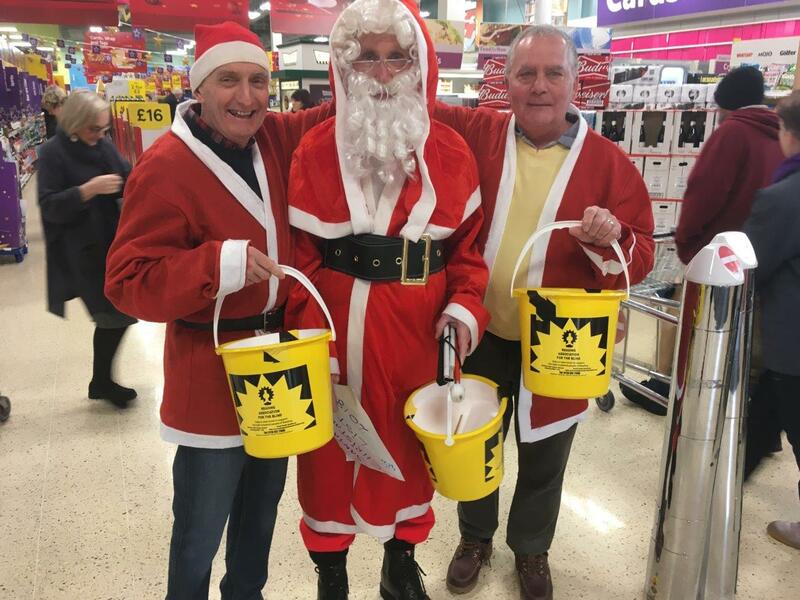 A collection day held at Tesco Store on Oxford Road before Christmas raised an amazing £518 for RAB. Many volunteers from the rambling and bowls groups came along to help staff with the bucket collection. Pictured are Steve, Richard and Chris in their festive Christmas outfits! Not only were they raising awareness but also funds. Grateful thanks are extended to Tesco for their continued loyal support of the charity. 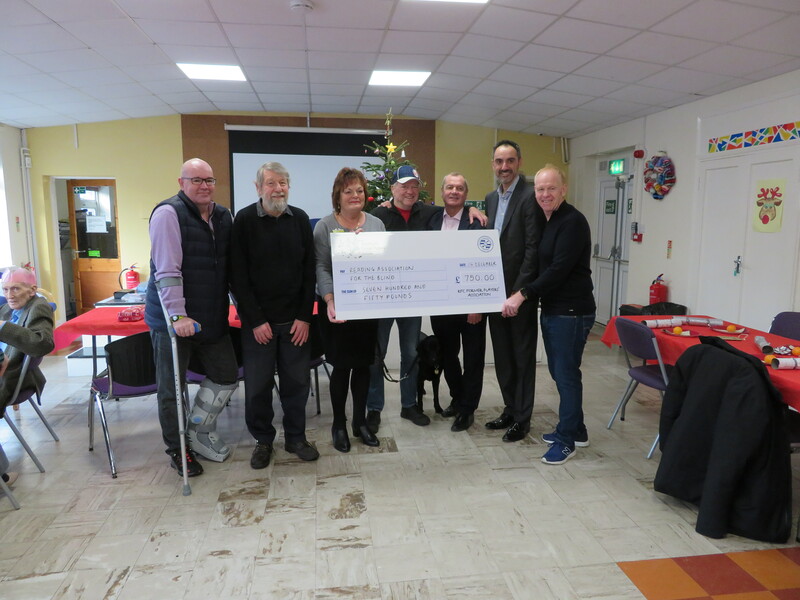 A Christmas Party held at Reading Association for the Blind, Walford Hall, Carey Street, Reading on Friday, 14 December, was enjoyed by service users, volunteers, staff, trustees and guide dogs!Also joining in the celebrations were George Friel, David Woolford, Mick Gooding, and Richard Forte, members of Reading Football Club Former Players Association. Reading FC Former Players Association elected RAB as their charity of the year for 2018, and donated a further £750 to the charity, making a total of £1250 for the year. Tony Lawton, a season ticket holder from Caversham, was delighted to meet with the members, and spent time talking about football with them. Tony said I so enjoy attending Reading FC matches, and I get great pleasure from being at the match with friends, and listening to the game and feeling the atmosphere. Bob Bristow, Chairman of RAB, said On behalf of everyone in the charity, a very big thank you to the Former Players Association for their support over the past year. Marion Haynes, Community Fundraiser, said Our Christmas party was made complete with Christmas Carols sung by Mary, who volunteered her time to sing to everyone. Christmas Fair at Reading Association for the Blind supported by local community. The Christmas Fair held at the Day Centre, Walford Hall, Carey Street, Reading on Tuesday, 4 December, attracted supporters from all over Reading and the local community. The Fair raised £450 to help continue providing services to sight impaired people of Reading. Service users, staff, volunteers, friends and families enjoyed buying Christmas cards & decorations, crafts, woodwork, beauty products and jewellery. Many of these items had been made by members in the Day Centre, and donated by Tesco and Asda. 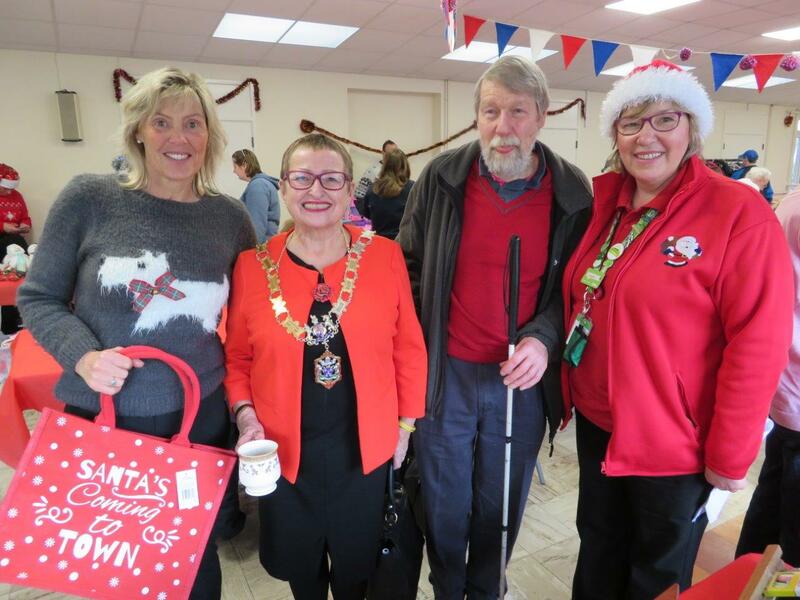 Bob Bristow, Chairman and Trustee of Reading Association for the Blind, said It was lovely to come along and buy items which had been donated and which had been made in the Day Centre. It was also a great pleasure to have Maria Page, Community Champion for the Tesco Reading West Store and Jacqueline Fieldsend, Community Champion for Asda, Meadway as supporters of the Charity. The Right Worshipful Mayor of Reading, Councillor Debs Edwards toured the stalls with Bob Bristow, and kindly prepared a Christmas broadcast for Reading Talking News. 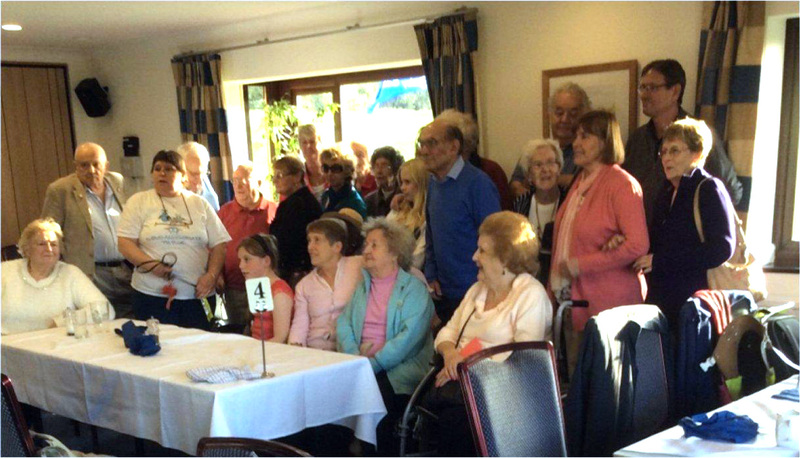 Marion Haynes, Community Fundraiser said It was lovely to see so many people visit the Day Centre from the local community, and we were visited by residents from Uppingham Gardens in Caversham. Our sight impaired members were thrilled to have such community support and gave a special thanks to all who attended.